Readers, this is my husband, Philip. Philip, meet my readers. They are a very nice lot! Introductions over, today I want to share with you that I have conquered another sewing fear: sewing a tailored man’s shirt. This is the first shirt I have ever sewn, so prepare to be bored to death with the details (I am understandably very proud of myself). And how did I accomplish this you may ask? With the help of the A-M-A-Z-I-N-G Pamela Howard and her Craftsy Classic Tailored Shirt lessons. I bought these lessons during the recent valentines sale, and they are worth every penny IMHO. Well, you get 12 lessons, ranging from between 10 minutes and 30 seconds in length to 1 hour and 5 minutes in length, introduced by Pam herself, and her soft, hypnotic voice. Yoooouuu wiiiiilllll beeee abbllleee toooo dooooo ittttt. Whilst a pattern is not included in the price of this course, Pam does give suggestions for patterns to use, namely Kwik Sew 3555 (which she makes during the tutorials), Kwik Sew 3027 (a darted ladies shirt), Kwik Sew 3586 (plus size ladies shirt) and Kwik Sew 3422 (a men’s version). 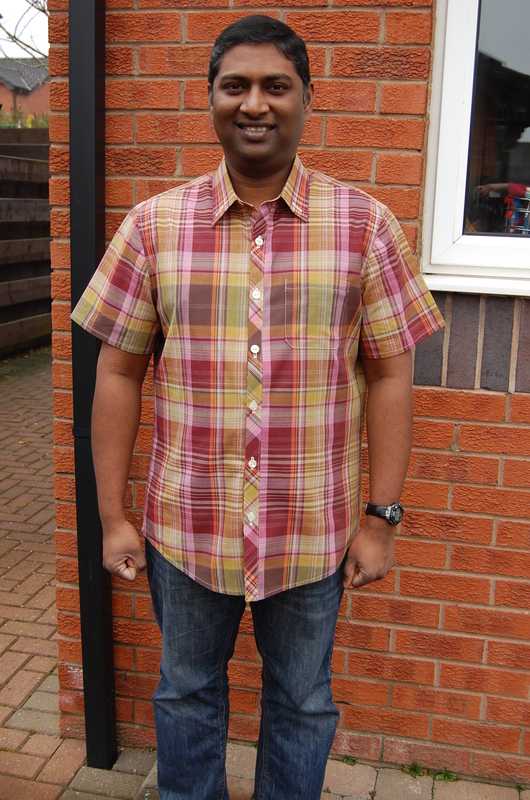 I had actually bought my shirt pattern before I purchased the Craftsy tutorials, so I used McCalls 6613, a unisex men’s/ women’s shirt….more on the specifics of that pattern later. After introducing herself, Pam talks through the anatomy of a shirt, including adjusting the seam allowances for the Kwik Sew patterns mentioned above, as these patterns only have a 1/4″ seam allowance, and you have to add 3/8″ to them to get your final 5/8″ seam allowance (worth bearing that in mind if you are lazy, like me :-)). Pam then demonstrates laying out and cutting out the shirt pieces, including how to lay the pattern pieces on grain. She even gives tips on the best way to hold your scissors to make cutting out easier and more accurate…these are tips you just don’t get from books! Note that there is a 10 minute 30 second lesson on “shirt front options”, which covers sewing darts (for the ladies), a 19 minute 20 second lesson on sleeve plackets and cuffs and a 22 minute lesson on pleats and cuffs, all of which I omitted as they didn’t apply to the style of shirt I was making. This is the advantage of the Craftsy platform, I have lifetime access to do back and view these lessons any time I want too. Pam shows you how to sew your front bands (note that the McCalls pattern I was using had separate front band pieces – see my review below, but I just sewed these on using the instructions from the pattern, then followed on with Pam). Pam also shows you how to accurately create and sew a patch pocket, how to sew the shirt back and shoulders, including a brilliant yoke trick (I believe it may also be called the burrito method? ), which avoids the need for any hand sewing and leaves a neat, completely enclosed finish. There is a lengthy lesson on sewing the collar and band, which will ensure you end up with professional, accurate results. Actually, this lesson contained the only thing I didn’t like: Pam suggests hand sewing the folded under edge of the collar/ band unit to the shirt to enclose the raw edges. I chose to machine stitch this part. Pam also shows you how to insert the sleeves in flat, and then using a flat fell seam to finish the sleeve and side seams. Other things which Pam covers in the lessons include how to drape fit the shirt and even how to give your finished shirt a final press. Can you tell how impressed I am with this set of lessons?! 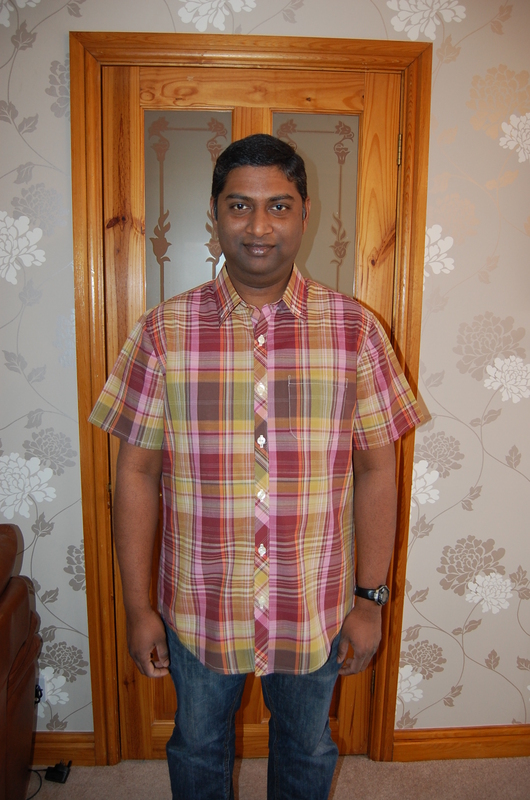 Philip is very proud of the shirt I have made for him and I actually really enjoyed making it!. So huge thumbs up from me. This is a completely independent review that I have chosen to write and it is my honest opinion! 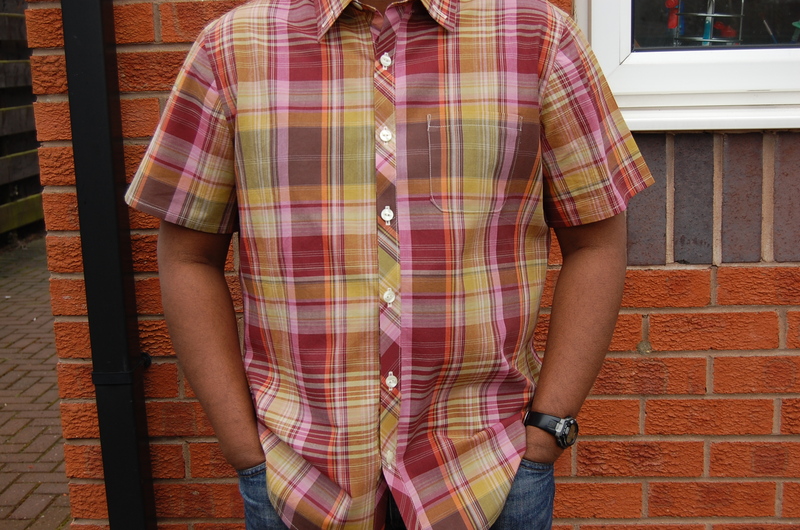 Now on to the McCalls pattern and the details of my shirt…. MISSES’/MEN’S SHIRTS: Fitted (men) shirts have collar, collar/front bands, self-lined yoke, forward shoulder seams, and narrow hem. A: stitched hem on sleeves. B: flaps, pleated pockets, opening for pen/pencil. C: bias front band/pockets, snap closings. B, C, D: long, two-piece sleeves with pleats, button cuffs (seam opening). B, C: rolled sleeves (wrong side shows). Collar, collar band, yoke, tabs B, C, cuffs B, C, D: cut on crosswise grain of fabric. I chose to make view A, but with the curved shirt tail hem as per views C and D.
Well, here is my complaint about this pattern. I bought this pattern because it is a Palmer and Pletsch pattern for McCalls, and I was hoping the instructions would really excel. Whilst the instructions do make adjusting the pattern easy (adjustment lines are indicated on the pattern e.g. 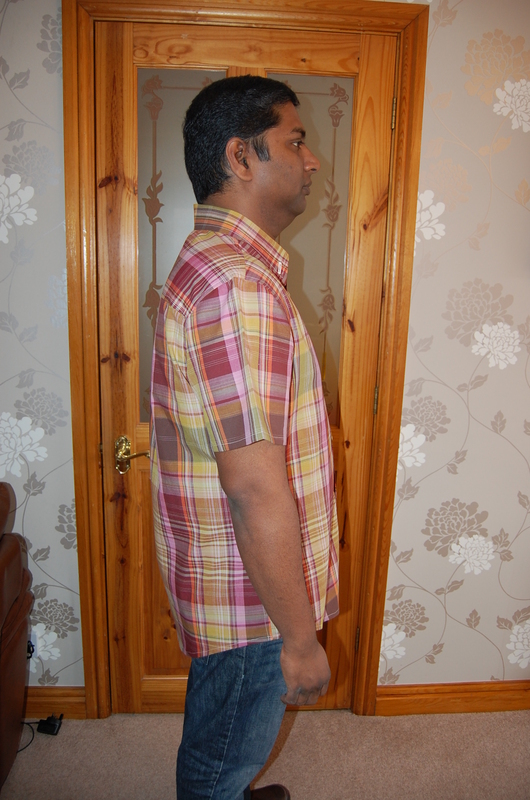 to do a FBA, sway back adjustment, rounded shoulder etc), the instructions DO NOT allow you to create a tailored shirt. That is why I disregarded the instructions completely and used Pam Howard’s Craftsy Classic Tailored Shirt tutorials, which I HIGHLY recommend. If you followed these pattern instructions you would end up with a shirt which would need to have seams finished e.g. serged and the sleeves would not be inserted flat but eased in – you would not end up with a men’s shirt as you would find in RTW. See above! Also, things to note is that the front bands for this shirt are cut SEPARATELY from the shirt fronts, on the bias, interfaced, and then attached to the shirt fronts. I can see how this makes more of a design feature of the front bands e.g. if you use a plaid, but if you don’t want this extra step then you probably should avoid this pattern. Also, there is no separate undercollar piece (do I sound like I know what I am talking about?! This is all thanks to the Classic Tailored Shirt lessons!). I cut the undercollar about 1/8″ smaller than the upper collar to allow for turn of cloth. A checked cotton from my local market. 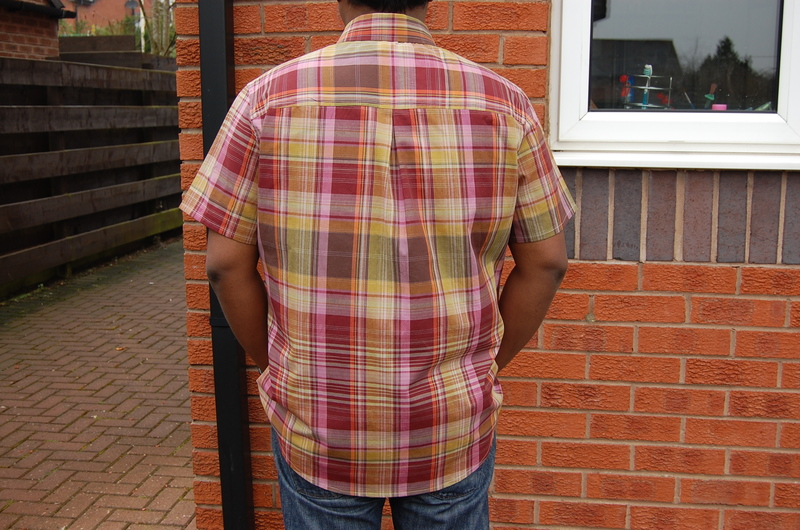 I also used Vlieseline H250 for the interfacing….it seems ok, but I would love to know what anyone else uses for shirts? Absolutely none. This was really a wearable muslin to see how to fit the husband, and it fits fine. The only thing I would change next time is to add maybe an inch or two to the length of the sleeves. So very proud of my first ever shirt, but couldn’t have done it without the Craftsy course! 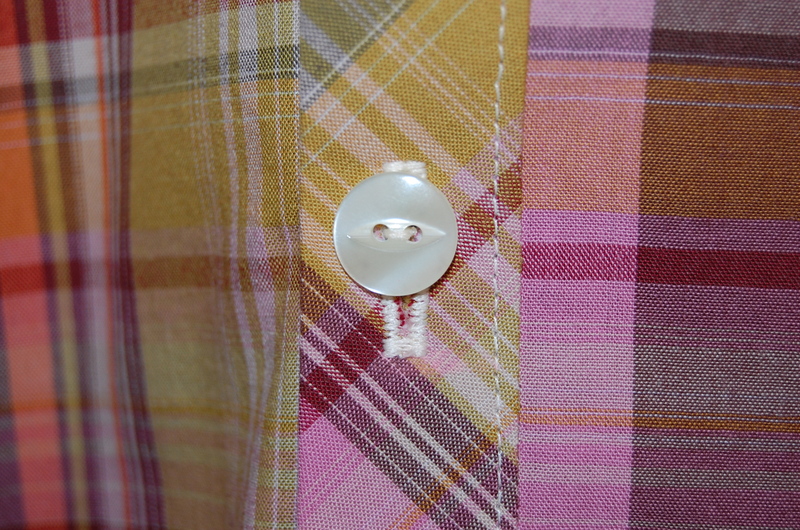 McCalls 6613 – I have to highlight my machine sewn on buttons – the first time ever I have used this feature on my machine. McCalls 6613 – one happy customer! So readers, what are your greatest sewing fears, and how are you going to tackle them? I know Victoria from the Ten Thousand Hours blogspot and Karen from Did You Make That (with her Sewlutions) are helping lots of you face your fears, but I would still love to hear. Until later…. Good job looks great. Love the Craftsy courses too. Great review of the Craftsy course. I have bought the Couture Dress one, and have a couple of free ones in my library, but to my shame I have not watched any of the lessons yet. Your review has spurred me on to at least have a look at them. Hi Sam, thanks very much. Yes, it does sometimes take a lot of self motivation to watch the lessons (even though we pay for them! )…I have watched all the Gertie Bombshell ones (not sewn yet!) and only watched one Couture Dress one, so I am pleased I have used this one (almost) entirely. I would say even watching the Bombshell classes I picked up a few things that I didn’t know. I watch them on my phone in bed sometimes instead of reading! I am so impressed with your shirt that I am planning to buy a course from Craftsy. By the way, thank you so much for your review. And I found your review from Google search. Hi Lora, thanks so much and I really hope you enjoy making a shirt as much as I did. Glad the review was useful! Well done, Manju!! The shirt is fantastic … I’m impressed with such professional finish. You did a great job !!! Wow! Nice shirt, and such an obedient model! Hi mrs Alex. Thanks for your comment. This fabric came from carlisle covered market. There’s still one fabric stall left, and prices for what is there are reasonable. Hi Mari thanks, and looking forward to seeing your patterns! Happy to be of service Meigan 🙂 Seriously, if I can do it, anyone can! Well Done! I have been using David Coffin’s book, which I highly recommend in conjunction with Pams classes and you will feel like a master shirtmaker! I started making shirts because i just dont seem to fit in any RTW shirts very well, not to mention that paying $100+ for a poorly fitting, poorly made shirt from Nordstrom makes me cringe!! I am curious as to what everyone is using as interfacing? David suggest Muslin and sewing it in instead of a fusible but most of my shirts are casual and i want to play around with some fusibles. I have read that fashionsewingsupply.com is the 100% go to spot for interfacing but there are so many options! Any suggestions? Hi David, I live in the UK so can’t comment on suppliers outside of the UK. I think in the UK English Couture are the place to go for interfacings. Like yourself, shirt fusible interfacings (particularly for men’s shirts) are something I am still exploring. Will be interested to hear what you find out though.